… but not chocolate. Just cheap suggary candy that I have loved since I was a kid of 10 or so. I have heard there are two types of sweet thing you can favor. One is chocolate which happens when you are older, or if you are like me, you keep that sugar tooth – the one that never grows up. So, if you are like me, you can give chocolate, the big whatever, but you still want all that sugary candy you grew up with and in my case that is amazingly true. And sad at the same time. Very sad. The things I love in the candy department are truly weird. Let us just start with Swedish Fish – which are not Swedish or Fish, but when I was young I was very allergic to seafood my father said “I just brought you some fish” – ha ha I thought – and then there were Swedish Fish from a department store and I was happier than you can imagine. Every time I eat a Swedish Fish or two it makes me think of my father. Especially now that the come in more “flavors” than red. Not sure what that is flavor that is supposed to be, but i kind of like the lemon and the lime ones the best. I also love sweet tarts, jelly beans, licorice (black only – the red kind is, so, not licorice), lemon drops, life savers (if they are the flavors I like), Juju Bees (don’t think I am spelling that correctly), Ju Ju Fruit – yes, a very immature palette. But one of my favorite candies is Zotz – but only the grape ones. Oh, lord this is such a long story, but since it is amazing late, I will save it for a day or two later. But I do have a grape Zot* now and it is just pretty much amazing. * Do not have the singular and/or the plural of this candy figured out at all. Maybe I am over thinking once again. I love toffee. I can’t help myself. And when you pair it with salty pretzels what is not to love? I am going to plan this carefully – Florida = humidity, but I think past weekend was my time. In May that is a strange land indeed. What the hell, I will give it a go. Line a baking pan with a Silpat. Cover with the pretzels in a single layer. Sprinkle walnuts evenly over the pretzels. Melt butter in a heavy saucepan. Add sugar and stir until dissolved. Cook until the sugar is light amber in color, about 7 – 10 minutes. It can separate but that’s okay. Pour sugar mixture over the pretzels with the walnuts. Top with chocolate chips then use an offset spatula to spread the chocolate over the toffee. Cool the toffee in fridge. Then break into big or middle-ish pieces. Store in an air-tight container in the fridge. Fridge = dry, and in NW Florida, at this time of year, that is a good thing for toffee. We are spoiled living in Florida – even though it’s north Florida. And in the late winter, which for us is, um. – just spring. It hasn’t been all that many weeks ago and the Florida strawberries came in – they were beautiful, perfect, in fact, amazingly cheap. Asparagus comes in next – at least to my mind I really only like it in the spring or late spring, but once it gets over that period I have used it so much that I’m kind of over it. 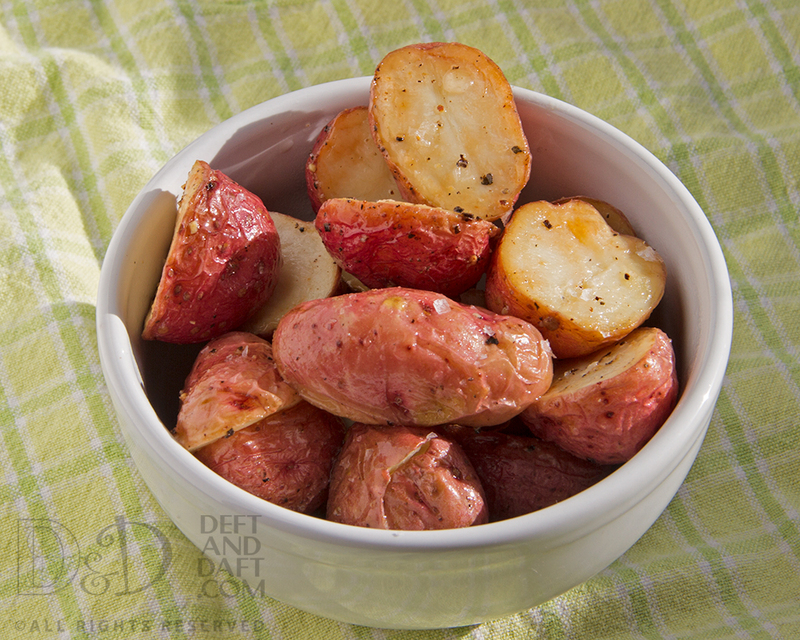 One of my simple favorites is the tiny red creamer potatoes that are grown locally and sold in the farmers’ market. They are so simply delicious that they take very little to roast them and they are almost sweet when you eat them. I leave them out on the stovetop after roasting. just walk by and get one as I go along making everything else. They rarely last past the day they are made. Just had a random though – I’m continually on the hunt for a perfect potato salad. Since these are perfect potatoes, why haven’t I tried to come up with that?? Jeez. To the farmers’ market we go.